Blog: Why Facebook will NEVER Reveal Profile Viewers? Why Facebook will NEVER Reveal Profile Viewers? However, Facebook will NEVER reveal your profile viewers. This post explains why. Liana Evans indirectly answers this question: Why Facebook is not allowing users to see who is seeing their profile? She wrote: "Humans are nosy". Psychologically speaking, she is 100% right. People love to know what others are doing, who is Z's new boyfriend, where friends had enjoyed last weekend, etc. Actually, this is the concept of social media networking that is revolutionizing our digital world today. But what would be a girl's reaction once she realizes that YOU are checking her entire Facebook profile items including photo albums and profile activities every day? It is scary. Such behavior triggers tens of questions: what do you want? why are you interested? why now? do you really know me? what if we are work/college colleagues, should she discuss the matter with you? OK. Thanks to Mark Zuckerberg who hanged all her questions by not implementing Facebook profile viewer feature (and will NEVER do). Facebook profile displays your own personal pictures, outgoing memories, family information, nasty comments, funny clips, and more. People are keen about their privacy (specially online privacy), and they became cautious once they realize related threat or intervention. YES: we all know that our Facebook friends can easily access our profile content BUT if we got to know our friends who are actually following our Facebook activities, we might deactivate our Facebook accounts! That's for Facebook and why it won't reveal profile viewers (unless Facebook marketing team had decided to severely decrease its upcoming stock exchange price). 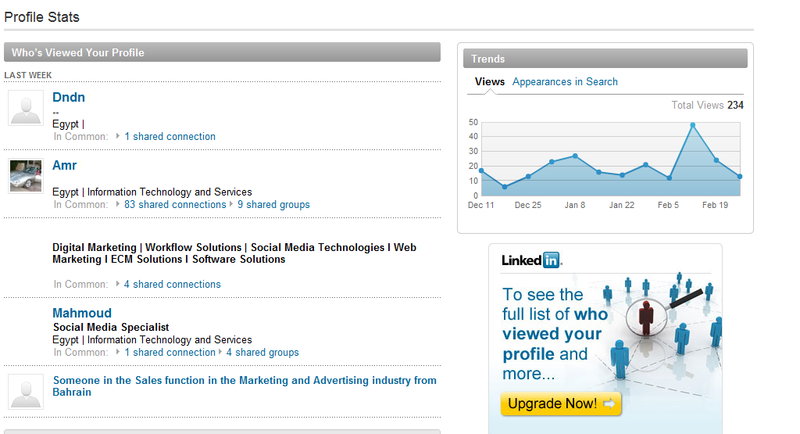 For LinkedIn, the matter is completely different. 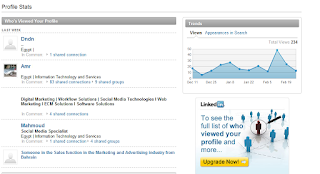 LinkedIn members are keen to get as much profile viewers as they can. This increases the probability of getting more job offers, consulting requests, speaking invitations, and more. Actually, LinkedIn offers you to upgrade your membership account to be able to track each and every profile viewer (including full name of non-connections). New Egypt Consulting is a Facebook & LinkedIn marketing company based in Cairo since 2011.